→Only One Jumper on the Trampoline at a Time or More? Summertime also means school vacation. Kids have plenty of time to get outside and enjoy various activities. Jumping on a ﻿﻿trampoline could be one of them. However, summertime is also the season when trampoline-related ﻿﻿injuries ﻿﻿increase. From minor sprains to broken bone, necks and spines, children can suffer from various injuries while using the trampoline due to various reasons. The number one cause is double or multiple bouncing on the trampoline. 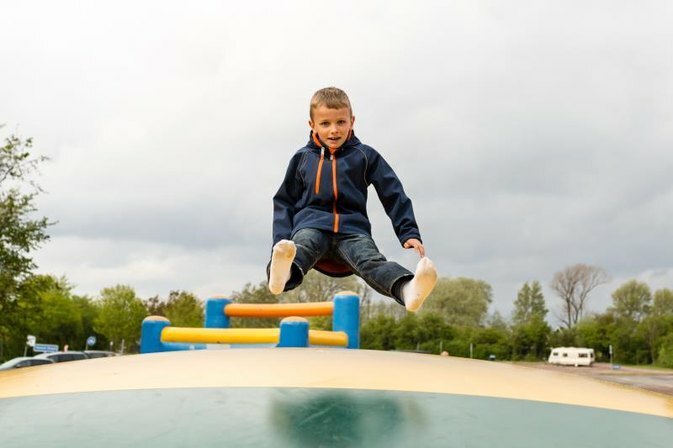 Whilst the American academy of Pediatrics strongly discourages the use of trampolines at home or in commercial places, still most of us love playing on it. As parents, our kids’ safety should be our number one priority. Thus, we should be strict in implementing this number one rule to decrease the risk of them getting injured around trampolines: only one jumper at a time! Probably, this one is the most crucial rule since kids like to play with their friends. Most of the reported injuries are due to kids colliding into each other in the trampoline. Smaller jumpers are usually the victims of injuries. In fact, kids younger than six years old are more prone to injuries. This is because younger kids still lack balance and cannot control their jumping. While modern trampoline manufacturers made improvements to their products to make it safer for kids, jumper collisions are beyond their control. Adults and parents should implement the “one jumper at a time rule” to avoid collisions. Children tend to somersault and flips while jumping, which increase their risk of having injuries. According to statistics, more than half of the injuries are due to multiple children jumping on a trampoline at the same time. Multiple jumping at a time can cause jumpers to fall off of trampolines, hit one another, land wrong and broke their bones. Older children are of higher risks of having serious injuries and concussions. Notice that most of the injuries occur in the lower extremities such as fractures and sprains. This is due to kids flipping and having contact with each other. This is also why they should use the trampoline one at a time. While most of these trampoline-related injuries occur in homes, the park-related injuries are also on the rise from 2010-2014 according to a news release from AAP. Also, injuries at trampoline parks are more serious compared to injuries occur in homes. This is because safety guidelines being implemented in trampoline parks vary. If you are allowing your kids to use ﻿﻿the ﻿﻿trampolines at recreational parks, make sure that the park is rigidly implementing the one jumper at a time rule. Constant adult supervision and following the AAP’s safety measures are crucial. Remember: Only one person at a time. Safety around ﻿﻿trampolines is always a red flag for most parents and the authorities. We often tend to conflicted, whether we like trampolines or not, but kids will always want to play with it. Keeping them safe at all time is indeed a huge challenge for parents like us. As parents, we can prevent our children from getting hurt while jumping on trampolines. Adults should actively watch the jumpers and allow a single jumper on the trampoline. Whilst our supervision does not guarantee their 100% safety, we will be able to at least, lessen their chances of getting injured. The safety features of a trampoline might give us a false peace of mind about our children’s welfare. According to the United States Consumer Product Safety Commission statistics, no trampoline is really safe to use. Usually, children are excited to use this equipment, thus they lose control while jumping on it. It is easier to control their jumping when they are alone in the trampoline. We also know that they love to play, compete and have fun together with their friends so, it is important that you will explain to them the consequences of jumping altogether on the trampoline. Discourage them from doing so or they will end up crashing to each other. Trampolines should be completely safe only if the users are following the safety guidelines. In this case, you cannot trust the kids not to disobey the “one jumper at a time rule” so you or an adult should supervise them. Trampolines really sound fun to both kids and adults. Most of us enjoyed our childhood days with our backyard trampolines. They are great recreational equipment that helps improve balance and cardio health. Sure children love to jump and they can do it all day despite the various horror stories being associated with trampolines. To put off the idea of kids getting injured, follow the one jumper at a time rule. Always follow this simple rule so you can keep them bouncing all day.